The first Expo Seguridad 2010 was held on October 20 and 21 at the Crowne Plaza Convention Center in Managua, the capital city of the largest Central American country, Nicaragua. The security fair was organized by the committee of the Association of Private Security Companies in Nicaragua, or ASEGPRIN in Spanish. Seguridad C&B Electronica, a renowned distributor of FingerTec in Nicaragua, proudly represented the brand in this expo where distributors and integrators of electronic security systems and physical security at a national level were all gathered to check out premier brands in the security industry. 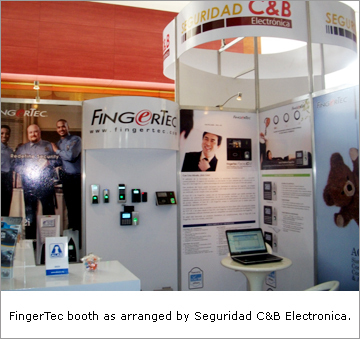 Seguridad C&B was using this platform to inflict FingerTec’s brand awareness in the industry at at the same time the company was aiming to recruit channels for FingerTec products tackling resellers from both office automation and security industry. Seguridad C&B targeted to replace the conventional clocking system and door locks to a fully automated attendance system and state-of-the-art access system using biometrics technology in Nicaragua’s work force at a faster pace. In this debut show, Seguridad C&B introduced TA100 series, Face ID, R2, Kadex and AC900 to visitors. Availability of Spanish translations in FingerTec’s hardware and the software is a major selling point of FingerTec products in this country. 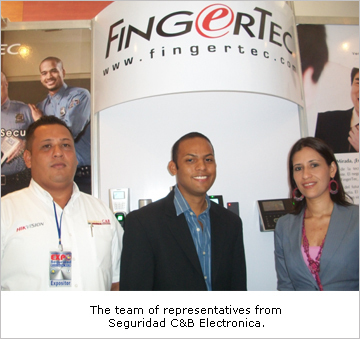 The fact that Seguridad C&B offered after sales services and support helped to promote FingerTec to its potential clients. Seguridad C&B dubbed this show a successful one and is looking forward to meet up with a few potential clients very soon.